Cartoonish graphics, simple and intuitive game play, free-to-play, Oh My Gods: Tower Defence has it all, and yet even though it's a grand game that's 100 percent free, it's not exactly a perfect ten. The second international release by Chinese publishers Yodo1, the Chinese-developed Greek mythology-themed tower defense OMG:TD is literally what you'd expect when you read the words "Greek mythology-themed tower defense." It is a tower defense game that lets you unleash the powers of the gods! The game begins with Daedalus (father of Icarus and the creator of the labyrinth in mythology) relaying to the player that the world is in danger and that the Gods of Olympus aren't playing nice. The player must take the role of arbitrator and help the gods defend the world. The player does this by placing gods around a map to battle waves of oncoming monsters. 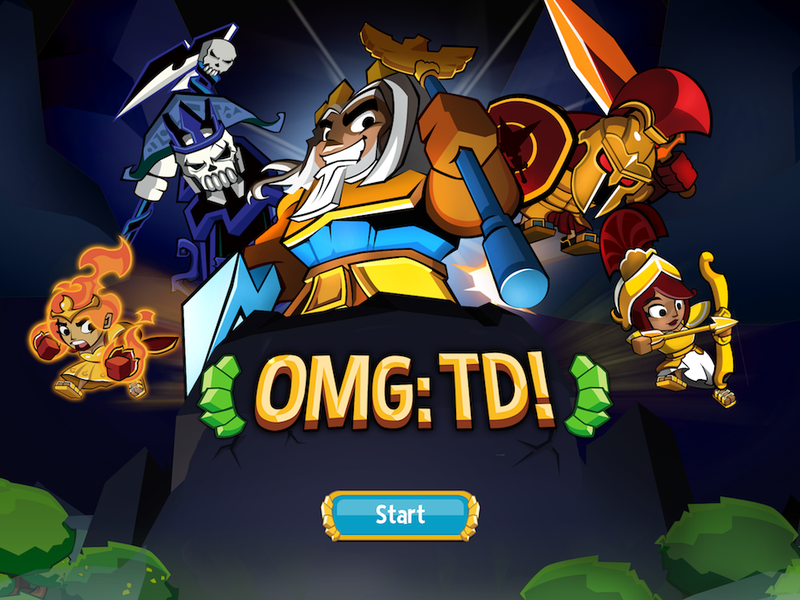 Placing towers and defeating waves of monsters pretty much sums up the basic gameplay of OMG: TD — just the basics. When the player places a god on the board, they can place multiples of the same god, be it Zeus and his thunderbolts to Ares and his sword. The game doesn't explain why there can be multiples of the same gods on the board, but I'm not bothered. As the monster waves are defeated, they leave gold and a soul. Gold is used to level up and purchase more gods to place on the map whereas souls are used outside of the battle maps to buy upgrades and such. OMG: TD starts to slightly deviate from core Tower Defence mechanics with the addition of a controllable hero. Right now there are four heroes: Heracles, a centaur, a griffin, and a siren, each with their own special skills and abilities. The heroes can be moved to battle oncoming swarms or set up to buff nearby "god towers." Like the towers, the the heroes can be leveled up using the souls gained during battle. And speaking of battle... battle is where OMG:TD shines and wanes at the same time. With a total of four different heroes and nine different gods, there are various different ways to set up the field for battle. The addition of the occasional boss battle freshens up the repetitive nature of defending against swarms but, like all tower defense games, the gameplay becomes a bit stale. Also, while the game is free, there are lots of in app purchases. I can't count how many there are, but the big three are where you buy more gold, more souls, and hats for heroes. The game is completely enjoyable and playable without using them—props to developer Red Rocket Games and publisher Yodo1 for that. What is weird is that the game says that any in-app purchase will remove in-game ads, however when I played there were no ads; if there were ads, they didn't obstruct gameplay at all. Right now, OMG: TD offers around 20 different replayable levels with varying degrees of difficulty. How well the player does on each level is measured in terms of a star ranking a la Angry Birds. The graphics are simple and a joy to look at; they feel great on a device like the iPad Air. Unfortunately, unlike Yodo1's previous international offering Cavemania, OMG: TD hasn't exactly grown on me. At the end of the day, OMG:TD is a polished and simple game that unfortunately is hindered by the nature of its genre. But to each their own, who knows, maybe you, the reader, enjoy tower defense games. OMG: TD is a joy to behold, particularly the exploding sheep.